How much at the BMW dealer?? Wanted part number and price from the BMW dealer. THe previous poster got hte pads there also. For those of you who are using a hydraulic floor jack, could you please advise the minimum height of the jack or even model. I need to get a new one because my current jack will not work on the Solstice. 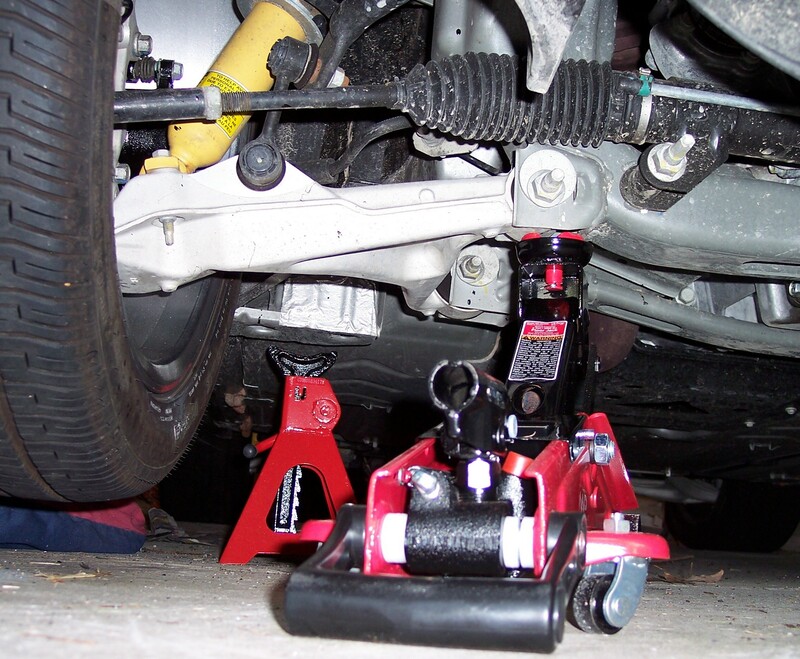 Would the Craftsmen aluminum race car jack with 3-3/4" minimum height work? When removing more than one tire at a time, like when rotating, how do you support the Solstice on jackstands? Can I use wood blocks under the suspension arms? I guess in short, if the jack is on the pad, where do I put the jackstand? I lifted the front from the "lifting points" and put 4 x 4 blocks ( or 6 x 6 ) under the front suspension arms. Lifted the entire rear from the differential and installed blocks at the lifting points. OK. Please be patient with me. I'm ready to paint my calipers. I have a floor jack. I have jack stands. I have thr pdf's of the lifting/jacking info. I've read everything I can find on the forum on this issue. I still have questions. Can someone get me pictures (I need to see the actual locations. The pdf's don't do it for me.) of EXACTLY where I need to place the jack stands, both front and back. I have NEVER used them before. Yes, I'm a bad person. Before I got my Solstice, I always had any work that required lifting the car (other than changing tires) done by professionals. 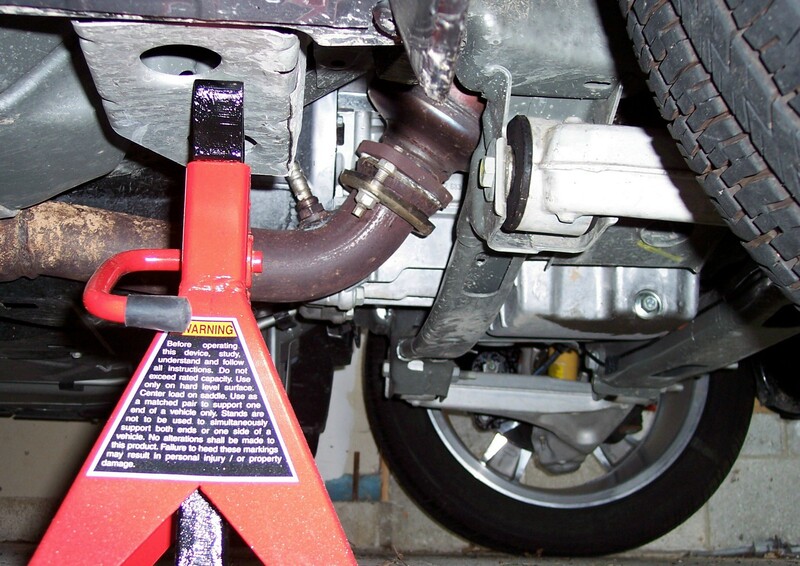 I have read that I can use the front lifting points and then place the jack stands. My question is WHERE, PRECISELY. XMM (whom I trust fully ) says I can use the differential to lift the rear end and then place the stands. Again, I need to know exactly where to put them. I can't mess my car up. I would die. I had the same questions as I suspect most of my future work will be done by me. In thinking about it I remembered a photo gallery by Brentil with his hitch install that had photos. Thats the post, the first link to his gallery shows the exact placement. Should do the trick for you. Thanks, ripple! Those pics show the rear jack stand locations perfectly! I assume I can use the corresponding structures in the front of the car for the front stands. No problem and I, like you would like to still see front lift and jack stand locations (although I am pretty darn sure I know the front lift locations) in photos just to be sure. I've also got the Clear Image shorty headers and hi-flow cat coming in pretty soon, so I'll be needing to lift the front again then! Somebody on here has the pics, I am sure. I have faith in my fellow Sol-sters! Okay so its a little scary since thats what I am planning on getting my lift and stands for too - plus exhaust too for me. THANK YOU!!!!! I await your next post.